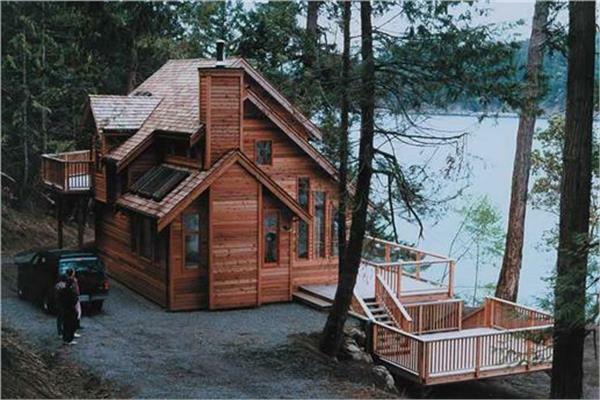 Our Canadian style house plans are designed by architects and designers who are familiar with the Canadian market. Just like the country itself, these plans embody a sense of rugged beauty combined with all the comforts of modern homes. The plans are available in an impressive variety of architectural styles, from cabins and cottages to contemporary and traditional styles that reflect the country's Eurpopean roots and represent the diverse and unique areas of the country. Every one of the plans featured in this section is made to comply with the International Residential Code for building in both Canada and the United States. Canada’s breathtaking wintry areas in the north contain a huge array of cabins and cottages, perfect for use as a vacation getaway or a year-round home in the right location. These types of Canadian home designs can include rustic exteriors that resemble log cabins by utilizing natural wood materials, as well as more current stylings that take the concept of a cozy cottage and incorporate clean lines and modern aesthetics. Homeowners looking for a more traditional design can also find countless Canadian home plans with a contemporary design that’s perfect for any neighborhood. Whether it’s a two-story house with multiple bedrooms to accommodate a big family or a quaint two-bedroom home for a couple whose children are all grown up, homeowners will find the perfect option. Many of the plans also include a large amount of windows to take in lakefront, mountain range, or other natural views. No matter the type of style, homeowners can trust Canadian house plans to include sturdy and reliable construction – many using 2x6 framing – meant to withstand colder weather and harsh conditions. Another common feature of these houses is that they often take uncommon terrain into account, such as sloping hills and rocky ground, especially for homes suited to more rural areas. If you’re looking to bring the styles of Ontario to the US, or are moving to Toronto and looking to build, browse through our Canadian style floor plans and reach out to us with any questions you may have.